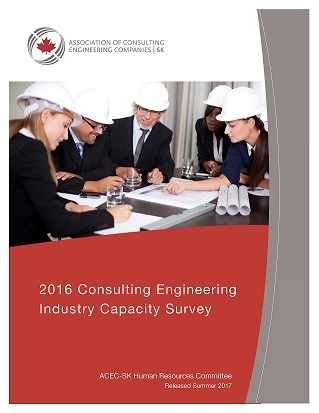 In 2016 your association circulated an industry capacity survey that provided a baseline measure of Saskatchewan’s consulting engineering and geoscience industry’s capacity. If you missed it, here are the results. In the fall of 2018, ACEC-SK’s Industry Capacity Survey - Phase II - will be circulated, but this time the focus will be on the capacity of specific areas of specialized practice within various industry sectors. The association continues to receive inquiries from various industry clients about this type of data. How many people will be retiring in the near future who practice in commonly applied Saskatchewan fields of specialization ? What is the dominant “field of specialization” in each industry sector? List the most prevalent barriers faced by each sector – backlog (lack of work), resources (skilled professionals), competition (saturated market), etc. What types of skill-sets will be necessary to operate a consulting business in our province in the future, and where are the current gaps? What can your association do to help address those gaps? We encourage member firms to look for this important industry project later this fall. When it’s released, please take the time to help us understand what the industry looks like today, and what needs we will be facing in the future.